How do you support your webcam when you are filming pencil tests? Do you use a tripod, a chair or a pile of books? This post will tell you how to build a simple webcam rostrum using just a screwdriver, a drill and a saw. If you get your wood merchant to cut the wood to size you won’t even need a saw. If you opt for the bracket method you may not need a drill. A large Animation Rostrum complete with lights. 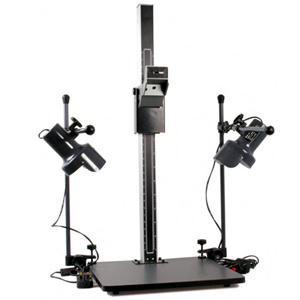 This rostrum has a rigid stand and decent lighting system. 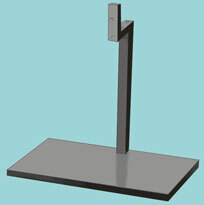 The base board is 45cm x 45cm and the column is 92cm high. It includes a baseboard, column and 2 Lights. Price £149.99. This compact rostrum is for lightweight compact cameras. It’s a good choice for those starting out in animation. Its baseboard is 30.5cm x 23cm and column height can be set from 7 to 30.5cm. It includes a baseboard and telescopic column. Price £20.99. At the price of the small rostrum it is hardly worth building your own. However, maybe you are on a tight budget or just enjoy dong it yourself. You may already have some off-cuts of wood in your workshop that can be utilised. Or your local wood merchant may have an off-cut bargain bin. Baseboard: Chipboard 18mm thick, width and depth about 150mm larger that the animation paper you are using. Column and top arm: Planed Smooth Timber 44mm x 44mm square, length around 400mm. Camera bracket: Planed Smooth Timber 44mm x 18mm x 100mm. Camera bolt: ¼ inch Witworth fits most cameras. If you are unsure take your camera to the hardware store and try it. Be careful not to damage the camera thread when testing. Click diagram for larger version. Top arm = A – B. Column = C – D.
Base board depth = E + F.
Baseboard width = animation paper width + 20mm. The length of the column (C – D) can be be worked out by holding the camera above a sheet of animation paper and moving it up and down until you get the best fit of the paper on the screen. Cut the materials to size. Drill, screw and assemble using the diagram as a guide. An alternative method of assembly is to use brackets. Lighting can be the available light in the room since webcams usually work in low light. Or you could use a couple of small desk lamps, one either side, to give more consistent coverage. 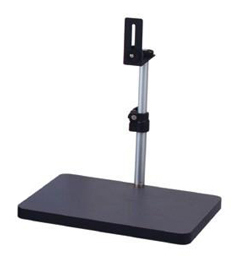 If you fancy building a more comprehensive stand suitable for a video camera or light 16mm camera then take a look at my D.I.Y Rostrum article in the magazine library section of this blog (Animator mag issue 14).